Trunks are a dorm room necessity for storing all your college essentials. DormCo's USA Made Steel Trunks are durably constructed to provide additional heavy duty storage space in your college dorm room. 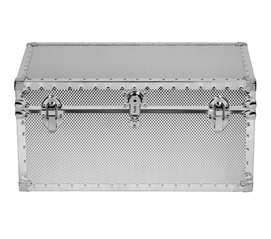 Keep all your valuable items protected within the vinyl lined and fire retardant steel walls. These trunks are available in a variety of sizes and styles to best suit your dorm room needs, and consider customizing them with wheels or a hardwood tray to make the most out of your storage space. You'll rely on these sturdy trunks throughout college for a neat and organized dorm room. A college trunk is a necessary dorm supply for you to bring with you when you head off to college. Add wheels to one of our USA Made Steel Trunks to help make move in day easier and find the perfect spot in your dorm room for this essential college item. Once you're all settled, your must have college trunk doubles as dorm room storage, holding your extra Twin XL bedding and other useful dorm supplies.